While I'm not in school anymore, part of me still thinks of September as back to school month. This month I've been listening to a lot of music that I used to listen to in my high school and early college years (aka the MySpace days). Don't you miss the days when you would spend minutes (or sometimes hours) trying to find the *perfect* song for your profile? I know I would spend so much time browsing the music section on MySpace trying to find obscure European bands that many of my high school peers had never heard about. I still love and listen to some of bands and singers I discovered on MySpace like The Bird and the Bee, Feist, and Nouvelle Vague. 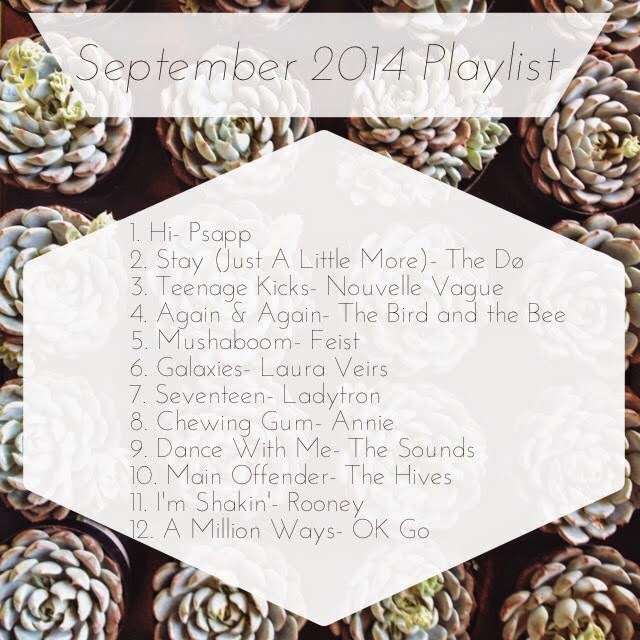 This month's playlist is inspired by MySpace and the music discoveries I made during those years. My taste in music hasn't changed drastically over the years. I still like my Swedish pop, I still love French music, and I'm still listening to indie-rock. When I was making this playlist I got taken back to a time when my life was a lot simpler. Sure, I had college applications to worry about but at least I wasn't faced with the most annoying questions as a 20 year-old: "What are you going to do with your life?" I wish I could give people a definitive answer but the truth is I don't know. I am one of those people that reminisces about the past often. I just find the past very comforting even if there has been some rocky moments during my teen years. The future is a scary place that I often avoid thinking of, so for the moment I'm just going to put on my headphones and remember all the good times during my teenage years. What were some of the songs that you remember putting on your MySpace profile? Let me know in the comments below.